It's the same on all channels for ref and BW limit doesn't make any difference. 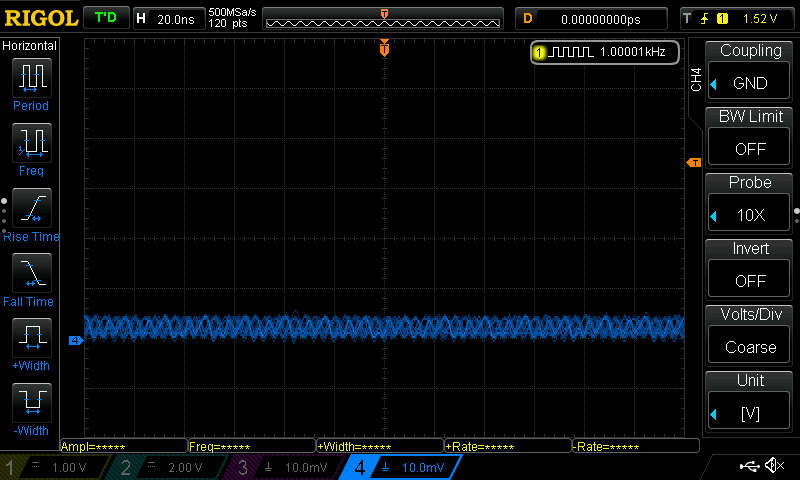 If you want to properly investigate a signal on a scope (any scope) be sure to trigger on the channel of interest and set the trigger within the amplitude of the waveform. I can't trigger on this. I have tried (on channel 1 where the trigger is set for ref!). You need be aware that on 10x settings on these scopes where actually the scope is set to 1mV/div there is an internal computed magnification of IIRC 5mV/div and the internal noise is amplified to what you see on the display. There are detailed posts about it somewhere on the forum. That makes perfect sense now. Thank you. I can't trigger on this. Sure you can. Select "Single" from the top righthand button, then in the Trigger section press "force". Thanks all - much appreciated. See amplitude measurement at the bottom of the graticule. Wasn't there a caveat with the 500uV setting on the 1054Z - the hardware to do that scale isn't present or similar? Yes, there is! But the newer hardware versions can display the 0.5 mV scale decently. In a few words, calculating the front-end attenuator and amplifier stages gain along with the ADC chip capabilities, the first two vertical input ranges are digital magnifications of the third range actual input. See a recent report of mine, regarding this issue. Oops... The link above is wrong. This is the correct one. If I am reading the DS1000Z user manual correctly, Vamp is not a useful measurement for noise. Vpp and Vrms should be used. It may be that the Rigol cannot accurately measure Vrms noise because of how the display is processed. Noise should not change significantly with time/div however fast time/div settings will ignore low frequency noise. For comparison, a very noisy 100 MHz oscilloscope should have less than 200uV RMS noise (1) and a reasonable one will be more like 20uV RMS. Most but not all analog oscilloscopes have a CRT beam width greater than their input noise making input noise measurements difficult. (1) The extra input circuits need to provide high common mode range differential inputs increase the noise of a simple single ended input by an order of magnitude. Thanks for the explanation - appreciated. 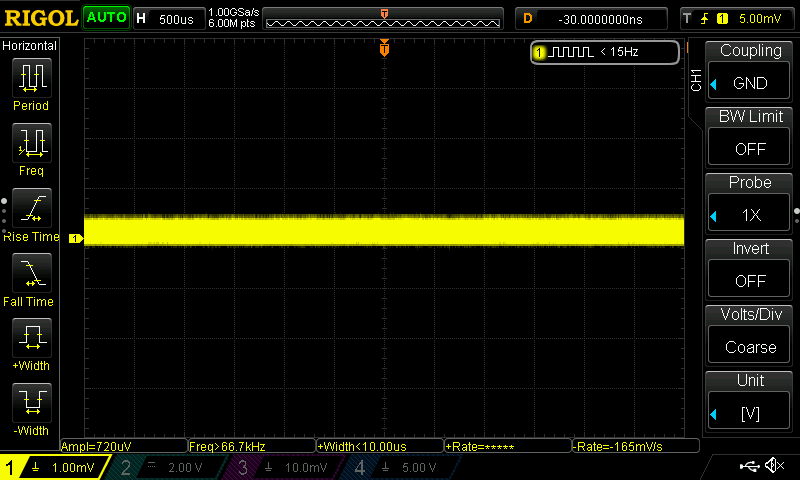 At a 20ns/div timebase you're looking at maybe a 100MHz waveform. My guess would be you're seeing the commercial FM band. Turn on the 20MHz BW limiter and see if it goes away. 20uV RMS seems extrem low. Can you please tell which scope reach such low value? The best scope I know (PicoScope 4262) reach 8.5uV RMS at 3MHz. This would be about 50uV RMS at 100MHz. And reasonable means not good or even very good. Which noise should a very good scope have? I measured it on a Tektronix 75 MHz 7A18A and 200 MHz 7A26 which was a little higher of course do to its higher bandwidth. That level of noise is comparable to the trace width of the 500 MHz 7904 mainframe that I used so I used the vertical output to gain access to the actual signal. When I measured the noise only with the CRT, it was about 40uV RMS do to the contribution from the trace width. The implication there is that these plug-ins could have supported a higher useful sensitivity. The much more complex 100 MHz 7A13 had a noise level of about 120uV RMS. That is explained by differential inputs which immediately add 3dB and cascode inputs which add additional noise and in this case a lot of additional noise because they support an exceptional +/-10 volt input range at a sensitivity of 1mV/div. I have some other single ended amplifiers with cascode inputs and they showed a similar increase in noise although not to that extent. I too was suspicious of the low measured noise of the 7A18A and 7A26 however it was consistent with the calculated noise based on the JFETs Tektronix used.